Alternative Manufacturing & Design (AM&D), formerly known as Alternative Metal Works, is a California based, woman (minority) owned business founded in 2005. With its corporate office located in Valencia, CA. Alternative manufacturing & Design caters to all customer manufacturing, design, & fabrication needs using top quality materials pertaining to the required industries and meeting ISO standard quality management system. We pride ourselves in global competitiveness, large product order handling, quick lead time, and manufacturing capacity. To provide guaranteed customer satisfaction through quality products that meet or exceed expectation. Through ethical business practices and workmanship, we are committed to design, manufacture, and assemble your products providing you with on time deliveries and competitive pricing. In a manufacturing atmosphere, a job that is planned and designed is often carried out multiple times without changing scope very much. Large scale orders of repeated jobs that we have mastered over time create the best results for our customers. Although our passion is as a job shop, true precision and quality comes out of repeatedly re-engineering the jobs we service. more..
Over the course of seven years we have done a plethora of custom fabrication jobs. 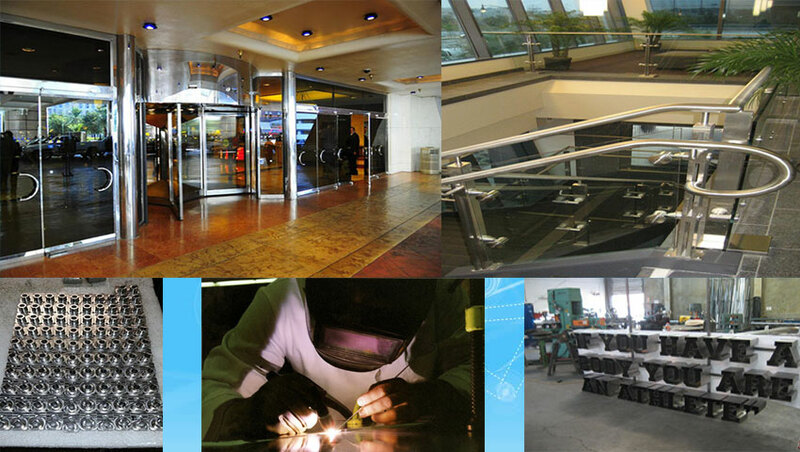 Staircases, Railings, Structural supports, architectural metal design, metal art and more. Our welders and planners work side by side through each step of our custom work to provide you the best components in the industry. more..
With our creativity, quick turn around capability, and fabrication expertise, we work extensively with the film and television industry, providing customized fabrication solutions. We are known for delivering high-skilled metal support components for set design, movie props, and more. more..
We have an in house design team comprising of: estimators, who attempt to win bids for work we are offered, engineers, who draw and program the design of the part/job on paper or by computer; planners, where all the team efforts come together for the workflow creation that goes through our shop. Final result is a newborn piece of metal ready for delivery! more..
With our team's over 30 years' of combined experience working with various metals and alloys, our techniques offer alternative solutions to most hi-tech industry equipment & component users. Whether it is electrical, electronics, and computers, we supply accessories that make your job easier. more.. Finished metal parts are being utilized in medical industry for processes, machinery, and products. We provide engineering design and manufacture customized medical support assessories that assist them to accomplish their job effectively. From custom cabinets to stairs and rails, we possess the capability to serve any kind of requirement you have. more..